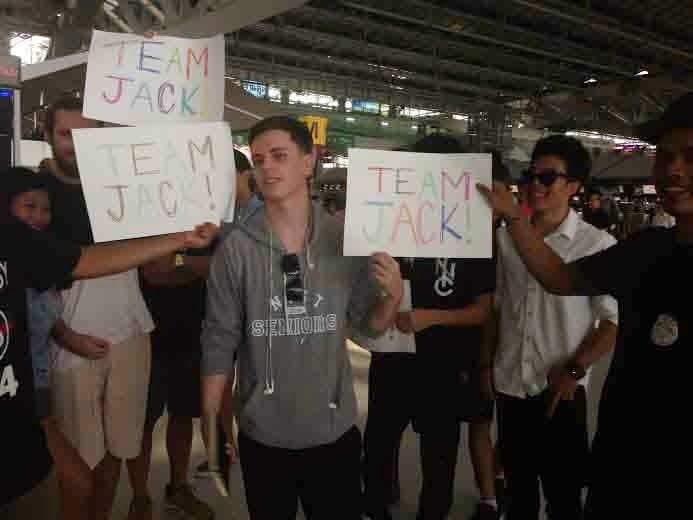 Jack Hansen-Bartel, the recently graduated pupil of the New International School of Thailand involved in the ‘Green Mango” controversy left for Australia at the weekend to a send-off from friends and colleague – not forgetting his campaigning mum Annie Hansen. Judges in Koh Samui have ordered his mother not to issue any more statements to the media in the case of Raymond Chang and Ryan Wang formerly of the Shanghai American School, who, it is alleged, assaulted Jack at the Green Mango Club at Chaweng Beach, Koh Samui last June requiring him to undergo surgery and repeated corrective surgery. Wang and Chang were charged – but the goalposts were removed when Raymond Nobu Chang, the father of Raymond Chang – blitzed into town and then Hansen-Bartel became the police victim. See earlier stories. With the principal prosecution witness out of the country (not by choice) and the two defendants in the United States one wonders whether any case will come to fruition. Jack Hansen-Bartel however insists he will be coming back to Thailand for the prosecution in June.